Tyrean is a seasoned author and poet who also teaches writing to home-school teens. She is also the author of Of Words and Swords about a dragon-slayer who wanted to become a bard. I spoke with her this week about her writing and her past experience with collections and anthologies. T: I like to ask what if questions and either see everyday life situations as an opportunity to think of fantasy alternatives to the same situation, to see the truth of reality within a fantastical or speculative realm. I get inspiration from life, newspaper articles, artwork, photography, movies, books, and music. T: Sharing with an audience of new readers (strangers to me) took a challenge from a friend to submit poetry to our college newspaper. I did it, succeeded in getting published, and then discovered the highs and lows of having an immediate response — some people hated it and were rude, some people loved it and shared their own stories with me. T: Yes. I’ve been in The Best of Everyday Poets 1 and 2, Sunday Snaps: The Stories, Overcoming Adversity: An Anthology for Andrew in fiction and I’ve been in two non-fiction anthologies. I enjoyed seeing my work alongside other authors’ work. 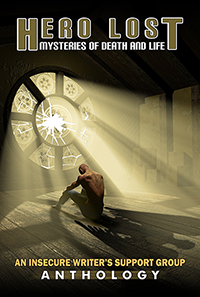 The Hero Lost: Mysteries of Life and Death is the first anthology that I’ve been involved with that included camaraderie and marketing with fellow authors and so far, I love that aspect. As for dislikes: I had a story accepted for an anthology that fell apart. Since I’ve had poems and stories accepted by e-zines that closed before they published my work, I didn’t see the loss of that anthology as terribly as other authors did. Sometimes publications and publishers thrive and sometimes they don’t. If a publication falls apart, I take my work and send it elsewhere. Dancing Lemur Press has a solid reputation so I think we’re in good hands. T: Truthfully, I’m always excited to get my work published. For this anthology, I’m most excited about getting my hands on the book and reading all the other stories that I didn’t write. T: I wrote this story for the fun of it, but I guess there is a point: finding the right words doesn’t necessarily come from locking ourselves in a dark and lonely attic. You can also follow Tyrean on her blog, Twitter or Facebook.